The National Pan Hellenic Council aids and fosters the welfare of the Divine 9 Greek letter organizations at Jackson State University. 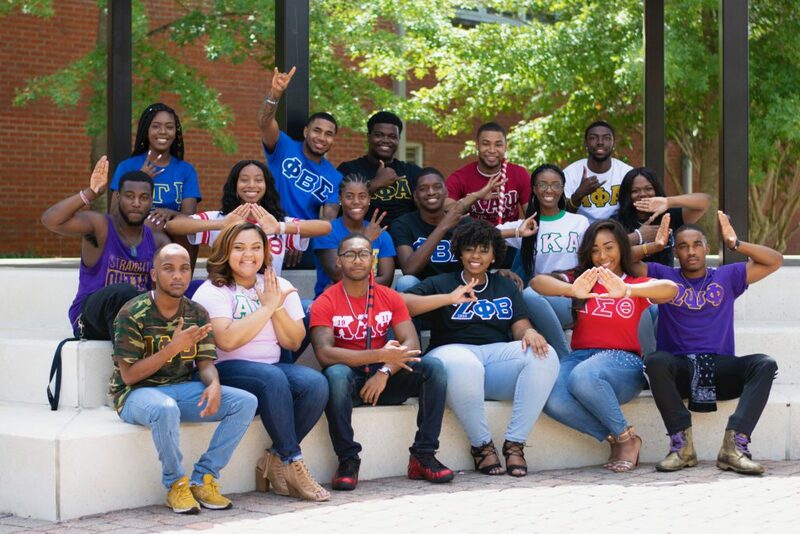 All NPHC organizations were founded on the principles of service, sisterhood/brotherhood and scholarship. Each fraternity or sorority is required to adhere to those principles and to promote academic excellence. ALPHA PHI ALPHA FRATERNITY, INC. was founded December 4, 1906, at Cornell University on the principles of scholarship, manly deeds and love for all mankind. Delta Phi Chapter was established at JSU on March 3, 1953. ALPHA KAPPA ALPHA SORORITY, INC. was founded January 15, 1908, at Howard University with the philosophy of cultivating and encouraging scholastic and ethical standards of unity and friendship. Gamma Rho Chapter was established at JSU on April 24, 1949. KAPPA ALPHA PSI FRATERNITY, INC. was founded on January 5, 1911, at the University of Indiana to assist aims of colleges and universities in uniting college men of culture in a band of brotherhood. Delta Delta Chapter was established at JSU on May 6, 1951. OMEGA PSI PHI FRATERNITY, INC. was founded on November 17, 1911, at Howard University with the ideals of scholarship, perseverance, manhood and uplifting of human kind in their hearts and the hearts of others. Upsilon Epsilon Chapter was established at JSU on March 25, 1949. DELTA SIGMA THETA SORORITY, INC. was founded on January 13, 1913, at Howard University as a public service sorority promoting academic excellence and providing assistance to the needy. Delta Pi Chapter was established at JSU on November 5, 1952. PHI BETA SIGMA FRATERNITY, INC. was founded on January 9, 1914, at Howard University on the principles of brotherhood, scholarship and service. Alpha Beta Chapter was established at JSU on November 21, 1927. ZETA PHI BETA SORORITY, INC. was founded on January 16, 1920, at Howard University with a vision predicated upon the ideals of scholarship, service, sisterly love and finer womanhood. Lambda Beta Chapter was established at JSU on March 16, 1948. SIGMA GAMMA RHO SORORITY, INC. was founded on November 12, 1922, at Butler University as an organization devoted to Greater Service, Greater Progress. Alpha Tau Chapter was established at JSU in 1941. IOTA PHI THETA FRATERNITY, INC. was founded on September 19, 1963, at Morgan State University and aims for the perpetuation of brotherhood, scholarship, leadership, citizenship and fidelity of all mankind. Delta Psi Chapter was established at JSU on August 1, 2003. Students interested in participating in membership intake must attend a University-sponsored Membership Intake Program (MIP) meeting. This mandatory meeting is held in the Fall Semester. Students interested in joining a fraternity or sorority must meet the requirements for MIP as listed. (Note: a $30.00 entrance fee is assessed). MIP REQUIREMENTS: Any full-time student that meets the following standards at the time of membership intake is eligible for the MIP process. Non-transfer students must have a minimum cumulative grade point average of 2.70, having acquired 30 semester hours at JSU and be enrolled at JSU the preceding two semesters. Transfer students must have a minimum cumulative grade point average of 2.70, having earned at least 18 semester hours at JSU and have been enrolled full-time at least one semester at JSU immediately prior to being eligible for membership intake. INDIVIDUAL FRATERNITIES AND SORORITIES RETAIN THE RIGHT TO REQUIRE CUMULATIVE GRADE POINT AVERAGES ABOVE THE MINIMUM 2.70 REQUIRED BY THE UNIVERSITY FOR MEMBERSHIP INTAKE AND ACTIVE MEMBERSHIP. To alleviate any misinformation concerning what constitutes hazing and the University's stance on any activities deemed as hazing, the following University statement and policy concerning hazing, the following University statement and policy concerning hazing are presented for your information. All rites and ceremonies of induction or private actions by individual actions which lead to occasions that allow mental or physical suffering are prohibited, including illegal, unrecognized or underground pledge/initiation lines. Specifically, hazing is denied as nay action taken or situation or intimidation created, intentionally whether on or off campus, to produce mental or physical discomfort, embarrassment, harassment, ridicule, or the breaking of school rules. Activities considered as "hazing" include two elements: (1) Coercion, either overt or covert, and (2) Production of physical or mental discomfort, in either the participant(s) or spectators. Such activities suggested or ordered by a group or a member of a group to new or trial members of a group to new or trial members will be considered to carry with them covert coercion, even if the activity is defined as "voluntary." Paddling in any form, physical and psychological shocks and creating excessive fatigue is always considered hazing. Other activities which very often carry with them elements of hazing are: quests, treasure hunts, scavenger hunts, road trips or any other such activities; wearing apparel in public which is conspicuous and not normally in good taste; engaging in public stunts and buffoonery; morally degrading or humiliating games and activities; late work sessions which interfere with scholastic activities which are not consistent with the regulations of the university. Participation in hazing subjects the individual or organization to University disciplinary action and may be punishable by law. Foster Unity: Have the members of your organization work together on a community service project. Visit a ropes course to work on group cohesiveness, communication, and leadership skills. In organizations with houses, the group might work together on a room improvement project. Another option for fostering unity without hazing is for the members to work together to plan a social or athletic event with another organization. Develop Problem Solving Abilities: Have new members discuss organization weaknesses such as poor recruitment, apathy, and poor scholarship, and plan solutions that the organization might then adopt. Invite university/community/business leaders into the organization to share their experiences. Instill a Sense of Membership: Plan special events when the entire organization gets together to attend a movie, play, or religious service. Plan a "membership circle" where students participate in a candlelight service in which each person has an opportunity to express what membership means to them. Promote Scholarship: Take advantage of your university academic and tutoring services. Designate study hours for members of your organization. Invite university or community experts to discuss test-taking skills, study methods, time management, etc. Build Awareness of Organization's History: Invite an older member to talk about the organization's early days, its founding, special traditions, and prominent former members. Aid Career Goals: Use university resources for seminars on resume writing, job interview skills, and for information on various careers. Involve All Members in the Community: Get involved with campus and community service projects. Plan fund raisers for local charitable organizations. Improve Relations with Other Organizations: Encourage new members to plan social or service projects with other organizations; work together to plan joint social or service activities.